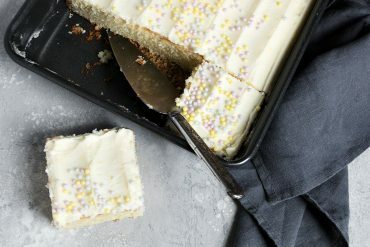 Delicious pumpkin layer cake, flavoured with brown butter and topped with a cream cheese icing. If this cake looks familiar to you, it’s because it’s the cake that is on the cover of the most current issue of Fine Cooking magazine. That cake had been calling to me every time I was in the check-out line at the grocery store and I spied it in the magazine rack. I bought the magazine and it’s been sitting on my coffee table saying “make me” for more weeks now. And with Canadian Thanksgiving just this past weekend, there really was no doubt that I’d find time to make this lovely Brown Butter Pumpkin Layer Cake to share with my family. This cake has a few more steps than your usual layer cake but trust me, it’s totally worth it! This cake is divine and the nuts and pepitas (which seem greener in my version, so I suspect I should have sauteed a wee bit little longer :), paired with the brown butter spiced pumpkin cake and brown butter cream cheese icing is perfect for any occasion, but especially for Thanksgiving. I used pumpkin puree from a Sugar Pie pumpkin but you can just as easily use canned pumpkin puree. 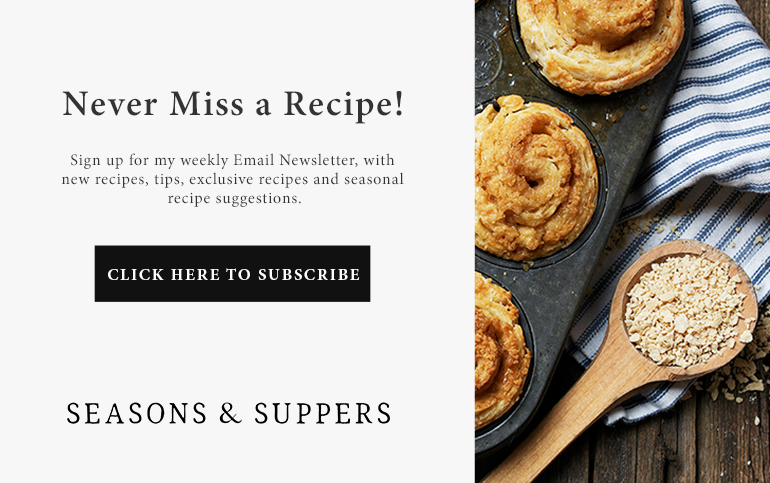 I did make a few minor adjustments to the recipe for my version. I only have 8-inch cake pans (I have no idea why I have never bought 9-inch ones:?! ), so I made 3 layers with my 8-inch pans instead of two 9-inch ones. I didn’t add the nuts between the layers (I thought the big pecans between the layers might make my cake not sit level and make it more difficult to cut through). I also left out the crystallized ginger, replacing it instead with a bit of powdered ginger, instead. I’m not a huge fan of crystallized ginger. If you love it, I’m sure you’ll love it in this cake, so go ahead and use it. If you’re not sure, you may wish to take the same route I did and replace it with powdered ginger instead. Finally, I increased the icing recipe by 1/4 as I thought I might need a bit more for my 3-layer cake (and it turns out I did!). This is a beautifully moist cake that keeps well and can be made ahead and refrigerated, which is always nice when cooking for an occasion. And speaking of occasions, I hope all my fellow Canadians had a wonderful Thanksgiving, too! You can bake this cake in 3 8-inch cake pans instead of the 2 9-inch. Just bake slightly less, about 20-22 minutes. If you do, you may also want to increase the icing recipe by 1/4 to compensate for the extra layer icing. Preheat oven to 350° F. with rack in the centre of the oven. Butter and flour two 9-inch round cake pans (or 3 8-inch pans) and line bottom with parchment paper. Melt the butter in a 1-quart saucepan over medium heat. Cook, swirling the pan occasionally until the butter turns a nutty golden-brown colour, about 4 minutes. Pour into a small bowl and let stand until cool but not set, about 15 minutes. In a medium bowl, whisk together the flour, baking soda, cinnamon, ginger, salt, and cloves. In a large bowl, whisk 1 1/2 cups of the pumpkin purée with the granulated sugar, brown sugar, eggs, and buttermilk until well blended. With a spatula, stir in the flour mixture just until combined. Gently whisk in the brown butter until incorporated. Divide the batter evenly between the prepared pans. Bake the cakes until a tester inserted in the centre comes out clean, about 28 minutes (or about 20 minutes for 8-inch pans). Let the cakes cool in the pans for 10 minutes. Turn the cakes out onto racks, remove the pan bottoms or parchment, and cool completely. 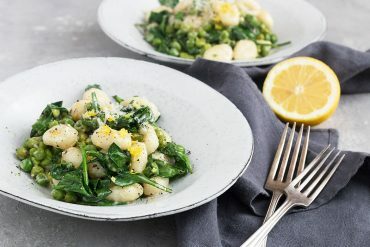 Make the topping: Melt the butter in a non-stick skillet over medium heat. Add the pecans and pepitas and cook until the pecans brown slightly and the pepitas begin to pop, about 2 minutes. Sprinkle in the brown sugar and salt and stir until the sugar melts and the nuts are glazed, about 2 minutes. Stir in the ginger. 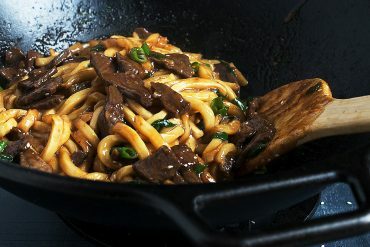 Remove from the heat and let the mixture cool in the skillet. 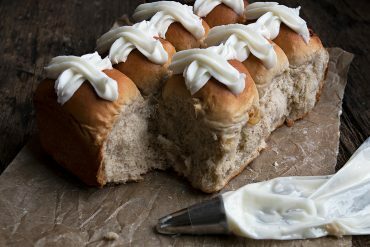 Make the frosting: Melt the butter in a 1-quart saucepan over medium heat. Cook, swirling the pan occasionally until the butter turns a nutty golden-brown, about 4 minutes. Pour into a small bowl and let stand until the solids settle at the bottom of the bowl, about 5 minutes. Carefully transfer the bowl to the freezer and chill until just firm, about 20 minutes. Using a spoon, carefully scrape the clear butter from bowl, leaving the browned solids at the bottom. Discard the solids. 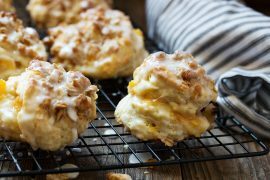 Using an electric mixer, beat the butter, cream cheese, and brown sugar on medium-high speed until light in colour and the brown sugar has dissolved, about 2 minutes. 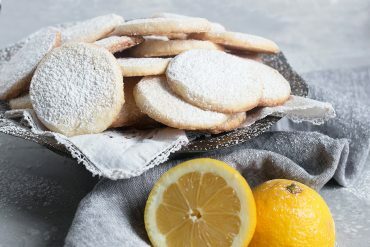 Gradually beat in the icing sugar and continue beating until fluffy, 1 to 2 minutes. The assembled, frosted cake can be covered with a cake dome and refrigerated for up to 2 days. Serve at room temperature. 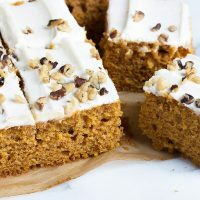 This easy and delicious Pumpkin Cake with Cream Cheese Frosting is a great snacking cake or dessert for a crowd! 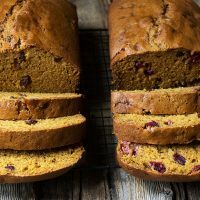 Easy and moist, this Simply Perfect Pumpkin Bread is the recipe for pumpkin bread I've been using for years! Always moist and delicious! 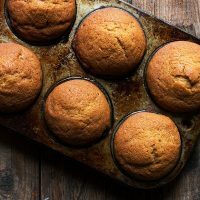 The recipe for these Simply Perfect Pumpkin Muffins has been my go-to classic pumpkin muffin recipe for years. Lovely and moist, perfectly domed and with a lightly crispy top. Does anyone have any suggestions on how to get the topping to be glazed and not grainy? 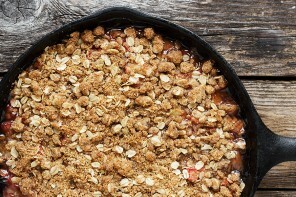 It tastes great, but I want the topping to be crunchier and look shiny like the topping in Fine Cooking’s photo. Hi Sue, The icing on this cake is a cream cheese frosting, so it’s never going to be a glaze or crunchy. If that’s what you’re after, I’d suggest using another recipe. 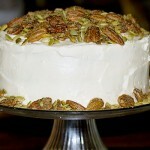 Actually I was referring to the glazed pecan and pepina topping, not the icing (I should have been more clear!). 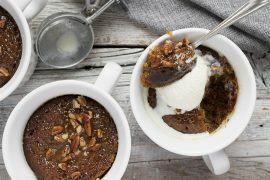 I would like the nut topping to look glazed and not grainy. Thanks! Ah, I see now. Hmmm. I made the topping as per the recipe, EXCEPT, I used powdered ginger instead of crystallized. If the one on FC is more glazed looking, I’d suggest that’s why. Thanks Jennifer. By the way, I like your idea of leaving out the topping between layers. The layers in your photot are really beautiful and level. I bet the cake cuts much better that way too. Oh you won’t be disappointed in this cake Mary. Ours is gone … but not forgotten! Sooooo good! Your cake is gorgeous–just as beautiful as the one on the magazine cover. I made pumpkin pie with fresh pumpkin for Thanksgiving, but luckily I still have some puree in the freezer. I know where it’s headed now! Thanks so much, Betty. It was a beautiful Fall weekend here and we had a great feast, indeed! I hope you had a lovely Thanksgiving! If this cake is any indication of your feast, I’m sure it was fabulous. 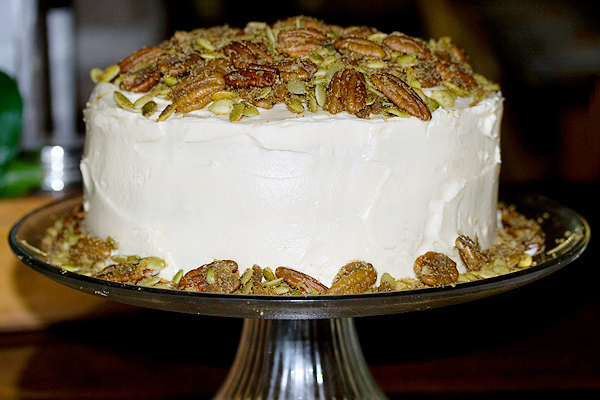 It looks amazing- I love the pecans and pepitas on the top! 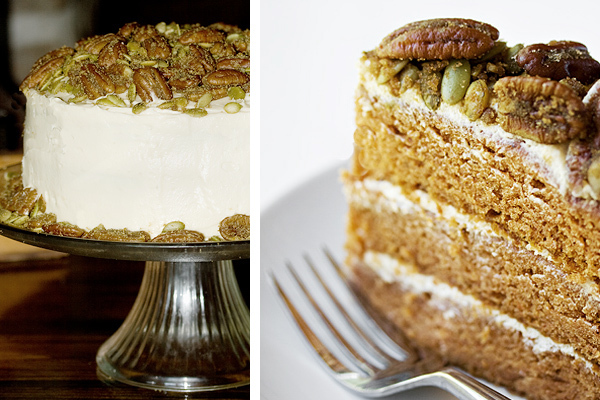 Lisa, I am usually a pumpkin pie gal at Thanksgiving but I passed it up for a piece of this cake and have no regrets. Every bit as satisfying! This looks like the ultimate pumpkin cake. Thanks so much, Jennifer. I’d definitely recommend it for a special treat. Wasn’t it yummy, Sharon? I agree. A definite keeper! Made this for Thanksgiving dinner and is was a hit. I could have had a lottery for the leftovers. Definitely a keeper.